Enter Your Email to Download Your Free E-book! Real success and wonderful champagne moments are just round the corner when you start to charge what you’re worth. And this free E-book makes creating it super easy. It’s short, simple, easy to use and will make a BIG difference to your business. 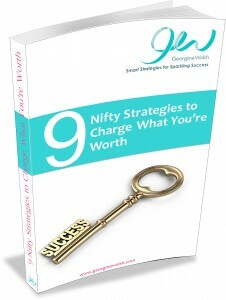 It takes you through 9 Nifty Strategies that you can put into action pretty much immediately, to help you charge what your worth and super boost your business.